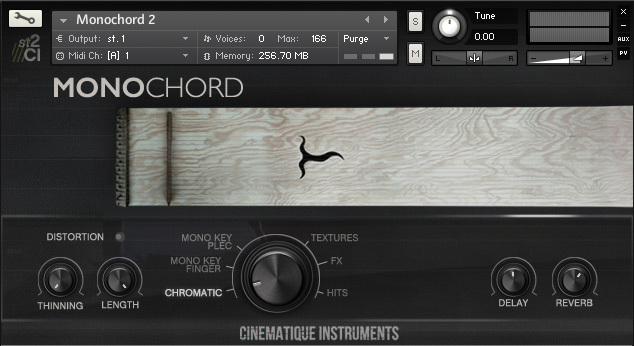 The word “monochord” means literally “one string”. It was originally constructed by Pythagoras for basic harmonical experiments of tones 2500 years ago. In those days it was a simple wooden plate with only one string. Today the Monochord is an instrument with many strings of the same length stretched over a wooden soundbox, all tuned to the same tone. If you slowly pass your hands alternately over the strings without a break, you get a long-lasting sound that is rich in overtones. Our German Monochord has 21 strings, one string tuned one octave lower. All strings are tuned to B.
Firstly we recorded separately each of the 21 strings of the Monochord plucked both with hands and plec in 2 or 3 dynamic variations. All the the strings were mapped in a range from C2 to C5 that you can pass your hands alternately over the keys related to the strings of the Monochord. Using this playing technique you get the typical long-lasting sound of the Monochord which you can transpose by using the key switch. Beyond that we recorded single strings in several Round Robin variations and dynamic layers that you can play the Monochord chromatically. Finally we created some intersting FX patches assembled from weird and experimental noises made with Monochord. We also added some scriptings to provide more opportunities. Update: In 2015 we updated the Monochord and put together all separate monochord patches into one complex patch covered by a brand new GUI. It is now possible to play all articulations on one patch - beside that, you can additionally now layer all fx patches at your own requirements.